Looking for a different type of DIY project? Something that is unique? 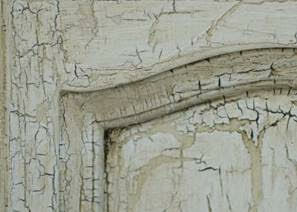 Distressed, antiqued furniture is often pricy and requires a long, stressful search for the right piece. But, now you can create your own antiqued look at a much cheaper price! 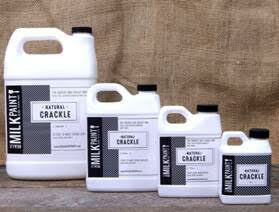 Real Milk Paint Company has a non-toxic, environmentally friendly DIY solution. 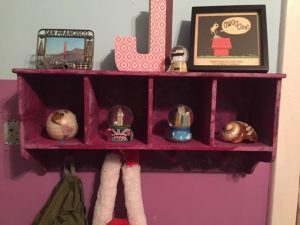 I received some of their paint in a dark pink and blue shade and also some Real Milk Paint Natural Crackle. My husband made some shelves for my one of our rooms and used this paint. 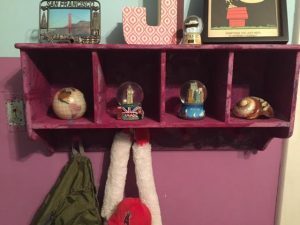 It is easy to use and gave the shelves an aged look in a very little amount of time! For those who want to crackle a current piece of furniture, antique or flea market find, Dwayne Siever, founder of Real Milk Paint Company, has created a quick step by step video, which can be viewed here. The Real Milk Paint Company provides environmentally friendly, non-toxic waxes, finishing products, mixing ingredients, creams and pastes, oils, and milk-based paints. All of its products are suitable for interior or exterior use, contain no VOCs and give off no odor during or after application. 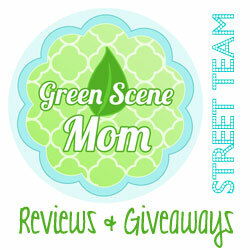 Self Disclosure: I received free samples from The Real Milk Paint Company to facilitate this post. Top photos were provided. Bottom photos: SoCal City Kids. One size does not fit all when it comes to jewelry. Wendy Mignot advises customers to keep size and proportion in mind when making a purchase. It is important that jewelry gifts are not only beautiful but also fit comfortably. When selecting a gift, determining your loved one’s size can be a challenge, so we recommend borrowing a piece from their collection to use as a guide. Many of the pieces in Wendy’s collections accommodate body types and personal style with varying sizes. Necklace sizing begins at a 14” choker-style fit and go to super long lengths depending on the piece. Bracelets especially work best when sized to fit the wrist. As a general guide, taller or large frame women can rock longer pearls and multiple layering while smaller and more petite ladies can make a single pearl stand out all on its own. Always be sure to keep in mind the size of the wearer for a necklace, bracelet or ring and remember that earrings fit everyone. If you don’t know the size, choose a piece that can be doubled, wrapped and layered to create the perfect fit. 2. DETERMINE WEARER’S PERSONAL STYLE. Whether your loved one is more conservative,has a free-spirited gypsy style or lands somewhere in between, their everyday lifestyle plays a huge role in selecting the perfect accessory. Consider the wearer’s personal style and age. Check out some of these style makers to match up personality with the perfect gift. The All Around the World, an updated take on a classic strand of pearls is perfect for a day at the office or a night on the town and is an updated sophisticated classic. The Mosey, Synergy, or any of the “Rain” pieces are a great go-to choices for fashionable girls who like to stay on trend. The single, three and five pearl designs are easily worn every day and are thepearlfect alternative for busy women who don’t want to think too much about matching and changing their jewelry rach time they change their wardrobe. For the free spirit into health and wellness, the “One Eye Love” Collection is inspirational and the “Gypsy” Collection with its mix of gems and pearls is artsy and unique for boho hippies. “JNM Reserve” Collection offers bold Tahitian pearls, ancient Shipwrecked Coins and Reptile Cuffs. 3. WHEN IN DOUBT, BE VERSATILE! When you are not sure what the recipient will like, consider choosing one of the“Versatile” pieces that offer different lengths, fashion styles and looks all in one piece. The “Wendy Signature” design as well as the “Versatile 4, 6 or 8 Pearl” necklaces can all be worn multiple ways which make them great pieces to both give and receive. 4. KEEP TO YOUR BUDGET. The Shops at Montebello is once again proud to help a deserving graduating senior pay for college. Simon Youth Foundation, a national nonprofit that provides educational opportunities for at-risk high school students, is now looking for qualified applicants who live near The Shops at Montebello and the surrounding community. Each year, Simon Youth Community Scholarships are awarded in every community across the country that is home to Simon, Mills, or Premium Outlets malls. The application period has begun and ends on March 1, 2017. Students can apply online by visiting syf.org/scholarships. Any student who will be graduating in the class of 2017 and lives in the community surrounding a Simon property is eligible. Applicants can check their eligibility by entering their ZIP code at syf.org/scholarships. Recipients will receive up to $1,500 to enroll in an accredited college, university, vocational or technical school. In addition, eleven regional awards called “Awards of Excellence” will be given to top candidates. The regions eligible are Atlanta, Austin, Boston, Chicago, Dallas, Indianapolis, Miami, New York, Orange County (CA), Orlando, and Seattle/Tacoma. Students from these areas will have the opportunity to receive a $10,000 award ($2,500 for up to four years). In 2016, the Simon Youth Foundation awarded $1.2 million to 300 students nationwide. “The cost of college continues to rise, and SYF is proud to partner with The Shops at Montebello to award scholarships that will remove some of the financial obstacles that could otherwise prevent a student from achieving the dream of a college education,” said Dr. J. Michael Durnil, SYF President and CEO. The 2017 SYF Community Scholarship recipients will be selected by International Scholarship and Tuition Services, Inc. (ISTS), a third-party administrator. Students are selected based on a variety of criteria, including financial need, academic performance, leadership skills and participation in school and community activities. Those students who are the first in their family to pursue a post secondary education will also be given close consideration. 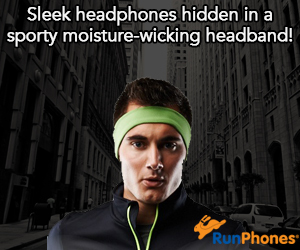 Recipients will be notified in May. SYF is a national non-profit that partners with public school districts to open dropout recovery academies inside Simon shopping malls. The organization now has 29 Simon Youth Academies in 12 states. In the organization’s 18-year history, more than 14,000 students have earned their diploma and more than $16 million in scholarships have been awarded. Visit syf.org or follow us on Facebook, Twitter (@simon_youth), or Instagram (@simonyouthfoundation) for updates. The Shops at Montebello is a modern indoor super regional shopping center featuring four department stores and more than 160 shops, eateries, and restaurants—remaining the leader for shopping in the San Gabriel Valley. The Shops at Montebello is home to Macy’s, Macy’s Home, JCPenney, Forever 21, Coach, G by Guess, H&M, Cotton On, Papaya and more, with dining options such as BJ’s Restaurant and Brewery, Hikari Sushi, and Olive Garden. The Shops at Montebello serves communities in San Gabriel Valley and East Los Angeles including Montebello, Monterey Park, and Rosemead. With its modernized look and feel, The Shops at Montebello strives to provide the best shopping experience with its retailer and dining selections for the entire family. Irvine Ranch Conservancy invites the community to get involved in stewardship programs to help preserve the Irvine Ranch Natural Landmarks and open spaces. Invasive weeds threaten the local habitat, disrupting the natural ecosystem and impeding native plants and wildlife. Joining a stewardship program to help combat invasive weeds not only helps the local lands, but also offers an opportunity to connect with nature and enjoy the great outdoors. Sahara Mustard is a harmful exotic weed that has invaded thousands of acres across Southern California, and is encroaching on the Landmarks. Over the past five years volunteers have successfully stifled the Sahara Mustard at Loma Ridge within the Irvine Ranch Open Space. Volunteers continue to maintain and monitor the invasive weeds at Loma Ridge, which is vital to keeping the weed at bay. The work of mustard-busting volunteers also led to the discovery of a new population of Sahara Mustard in Gypsum Canyon, but because of the hard work of stewards the weed was nearly eradicated. Removing invasive weeds not only helps native plant life thrive, it helps the local wildlife. The Cactus Wren is a little bird with big charm, known for its bold markings, raspy call, and fondness for living in groups. Simple actions like removing invasive weeds and watering native plants help this small bird maintain its place on the Landmarks, and gives volunteers a chance to be an active part of the preservation process for the Cactus Wren and many other animals on the open spaces. No experience is necessary for stewardship programs on the Irvine Ranch Natural Landmarks, and all tools are provided. It’s important to wear appropriate clothing and footwear, and remember to bring sunscreen, water and light snack. Click the programs below for more information and to register. 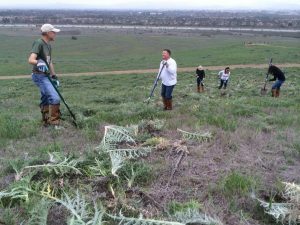 Pulling Together at Quail Hill on Thursday 2/16 helps keep wildlife healthy by weeding artichoke thistle from the Quail Hill loop in Irvine. This activity takes place on uneven terrain and sturdy hiking boots are recommended. Sahara Mustard Pull at Loma Ridge on Thursday, February 2/16 is an important program that helps remove harmful, exotic Sahara Mustard from the Landmarks. The program is reoccurring. Be a Friend to the Cactus Wren on Friday, 2/17 helps the local Cactus Wren thrive by removing invasive weeds and watering native plants. Sahara Mustard Pull at Gypsum Canyon on Thursday 2/23 helps staff volunteers remove pesky invasive Sahara Mustard. Dripping Springs Trail Restoration on Sunday, 2/26 invites volunteers to spend the afternoon restoring grassland, coastal sage scrub and woodland habitats, then hike to Dripping Springs. Join Irvine Ranch Conservancy volunteers to preserve the local lands. All activities are free with required pre-registration, which closes at 4 p.m. the day prior to each event. Some programs are suitable for children 12 and over, and children must be accompanied by a parent or adult guardian. For more details on stewardship programs on the Irvine Ranch Natural Landmarks visit LetsGoOutside.org/activities. On Valentine’s Day, Union Station’s Historic Ticketing Hall will be transformed into a romantic ballroom, with a special evening of tango, the dance of love and passion. Presented by Metro Art, the evening will feature a free tango lesson, a milonga (tango social dancing), accompanied by a live orchestra Tangótico, led by composer, arranger and producer Matias Piegari and a stirring dance performance by top tango performers Carlos Barrionuevo and Mayte Valdes. Carlos and Mayte, who in 2007 were cast in the critically acclaimed show Forever Tango, have performed in renowned international tango houses including El Viejo Almacen, El Cafe Tortonni, and Chiquin. In addition, the talented pair has danced for audiences across the globe, including at the New York City Center, Vail International Dance Festival, Jacob’s Pillow Dance Festival, and Israel Dance Festival. Born in Argentina, Matias Piegari began his career as a musical director, arranger and pianist. He attended UCLA’s program in film scoring and is now composing, arranging and producing music in Los Angeles. Matias has performed with many ensembles and orchestras and has done solo concerts, recitals and tango shows throughout the world, including the United States, Argentina, Uruguay, Paraguay, Brazil and Puerto Rico. Doors will open at 7:30 p.m. with the dance lesson at 8 p.m. and the Milonga at 8:30. The live orchestra will begin at 9 p.m. and continue until 10:30 p.m.
Metro Art Presents showcases free arts and cultural programs at historic Union Station. Produced by Metro Art, the diverse, all-ages programming creatively activates the landmark station, engages the Los Angeles community, and attracts new riders. The Queen Mary’s new breakout live music series, Local Band Hangout, continues with performances by Karina Nistal, Hellhounds of London, and Aragorn & Olivia on Thursday, February 16 at 7 p.m. in the Observation Bar. 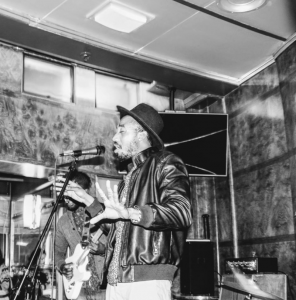 Local Band Hangout presents top local artists and up-and-coming bands performing live aboard the majestic Queen Mary every third Thursday of each month. The first concert in the series was a successful sell-out. The second event in the series on Thursday, February 16, welcomes three Southern California emerging artists including sultry, multi-faceted vocalist Karina Nistal, LA based rock-blues band Hellhounds of London, and acoustic duo Aragorn & Olivia. Arrive early to the Thursday night hotspot to enjoy Happy Hour from 5 – 7 p.m. in the picturesque art deco atmosphere. Concerts will continue the third Thursday of each month at 7 p.m. with future performances to be announced soon. Tickets to Local Band Hangout are $10 and the admission ticket value can be used in the Observation Bar and at Queen Mary restaurants during the concerts. Parking is $8 with validation. Tickets, additional concert details and the schedule of performances are available online at queenmary.com. In honor of World RARE Disease Day Global Genes, a leading rare disease patient advocacy organization, is proud to announce the first-ever Denim & Diamonds Fashion Show on Tuesday, February 28, 2017 at The Resort at Pelican Hill in Newport Coast, California. Produced by Newport Coasts’ own rare disease parent advocate Perla Portillo, models will walk the runway in honor of loved ones affected by rare disease on World RARE Disease Day. Celebrity guests, Madison McLaughlin (Arrow) and fitness model Shaka Smith, will join models on the runway in support of rare disease awareness. All proceeds from Denim & Diamonds will go directly to Global Genes’ RARE Patient Impact Grant, an exclusive funding opportunity for rare support groups and RARE Foundation Alliance patient organizations. The program provides critical medical equipment, family therapy, sensory equipment, sports programs, genetic testing, special outings for children with rare diseases, and much more. In 2016, over 17,000 patients and caregivers had their challenges of living with a rare disease reduced through the RARE Patient Impact Grant Program. Parent advocate and Denim & Diamonds creator, Perla Portillo, is a past recipient of a Global Genes Grant. Global Genes provided genetic testing and support groups for her daughter, Alanis Portillo. Though her daughter’s condition is still undiagnosed, Perla is certain that will change with the support of Global Genes. The Denim & Diamonds Fashion Show will showcase top denim collections from popular brands including Ella Moss, Freddy Jeans, Joseph Ribkoff, Miranda Frye, Ted Baker, Seven for All Mankind, Splendid, and Vitamin A Swim. 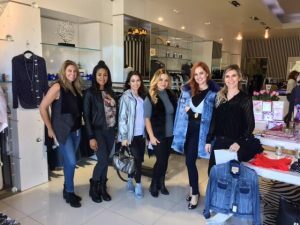 Newport Coast’s high end contemporary clothing, shoe, and accessory boutique, Jeanni Champagne, is providing clothing and will style the looks for the models. Social Dry Lounge will provide hair styling and Brax Jewelers is providing jewelry for the models. Credit: The Denim & Diamonds Fashion Show.